Unfortunately due its “state of sorry”, in 1997 El Molino was closed for public. Frankly, looking from the outside we all feel sorry realizing the level of deterioration of this fantastic structure. 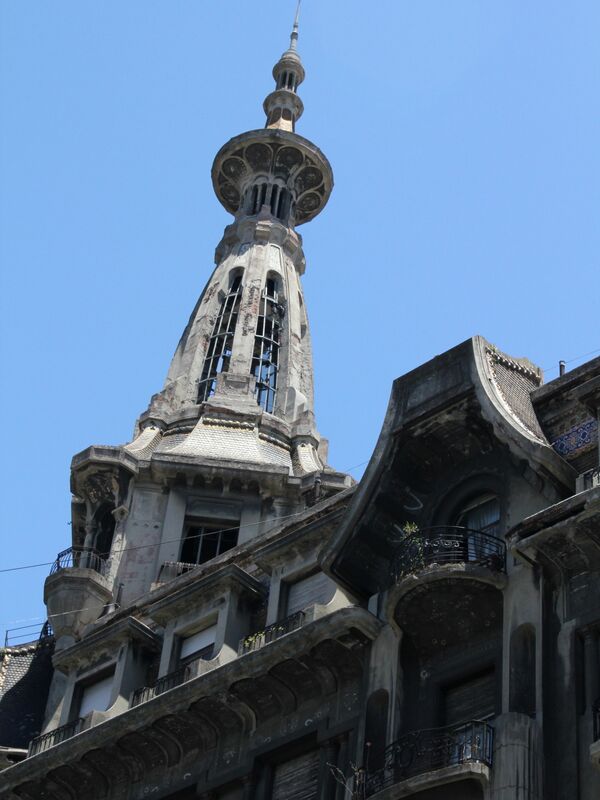 It is really a very sad story because throughout the years El Molino became the vital part of Buenos Aires’s vibrant identity. 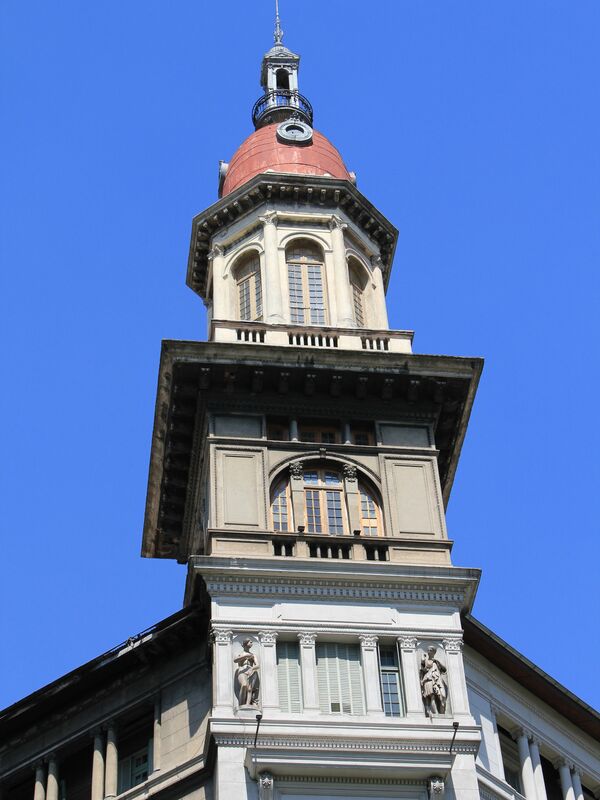 El Molino was commissioned in 1915 by Cayetano Brenna (famous Buenos Aires confectioner and co-owner of the Confectionery Center at the nearby Plaza Lorea). Most of the construction and finishing materials were imported by Brenna from Italy (doors, windows, marble, stained glass, ceramic tiles etc…). From the beginning, El Molino was designed to be “the best in the town”. 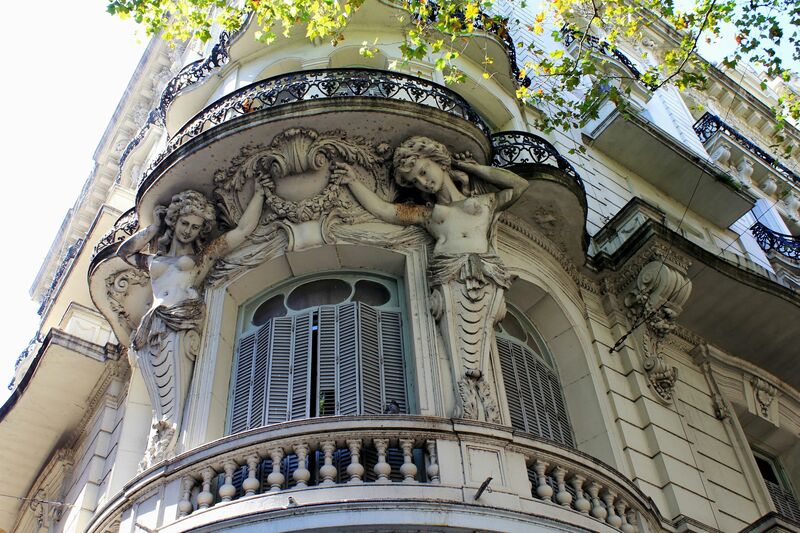 Indeed, when this Art-Nouveau style structure designed by an Italian architect Francisco Gianotti was finished in 1917 it instantly became a focal point in Buenos Aires. It gained and instant fame not only because the coffeehouse served best coffee and pastry in the city. 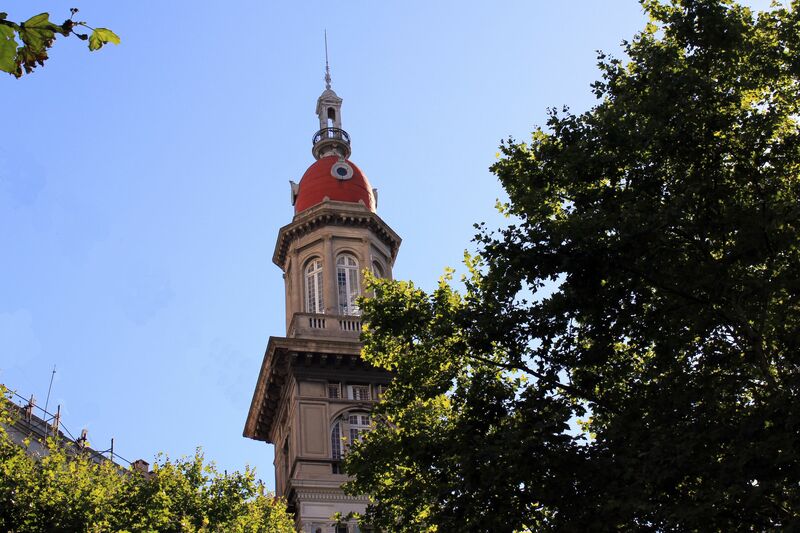 El Molino was also a highest building in Buenos Aires at that time with splendor and charm greatly enhanced by an electric illumination of its corner tower and a decorative windmill sails. 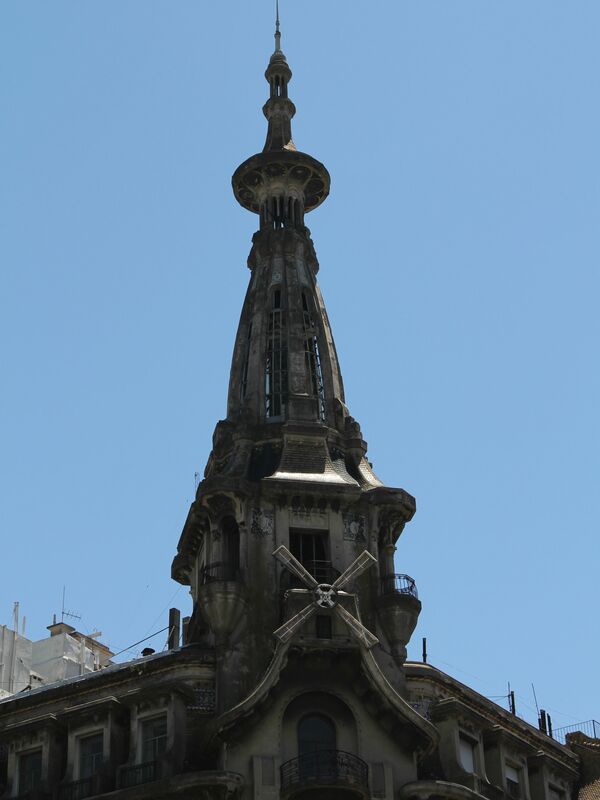 The end of El Molino’s “Bell Époque” was marked by the death of Cayetano Brenna in 1938. The business changed hands, went through bankruptcy and despite efforts of Brenna’s grandchildren trying to rescue the business and its name in early 80’s – El Molino closed doors. In 1997 El Molino was declared a National Historic Monument, but obviously this decision did not help much the structure. Nevertheless, the building is still an attraction for passersby and tourists. 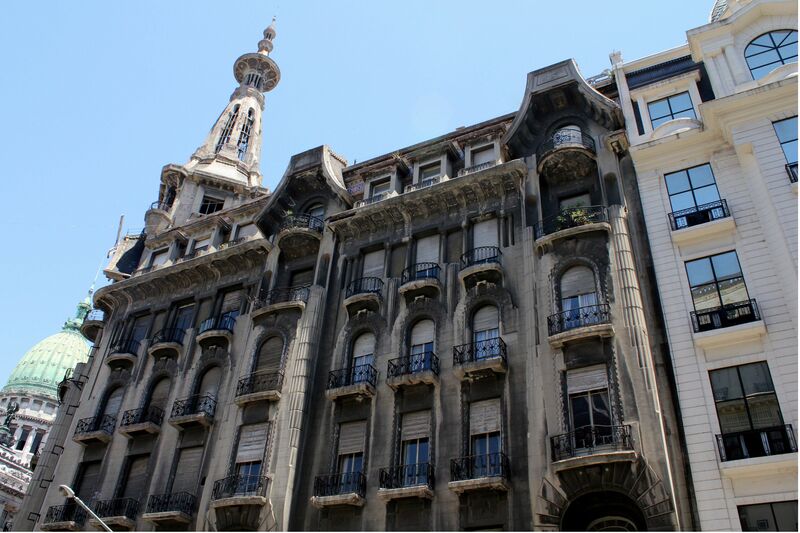 The building was founded by Antonio Devoto – the owner of the first insurance company in Buenos Aires “La Immobiliara” (Real Estate). 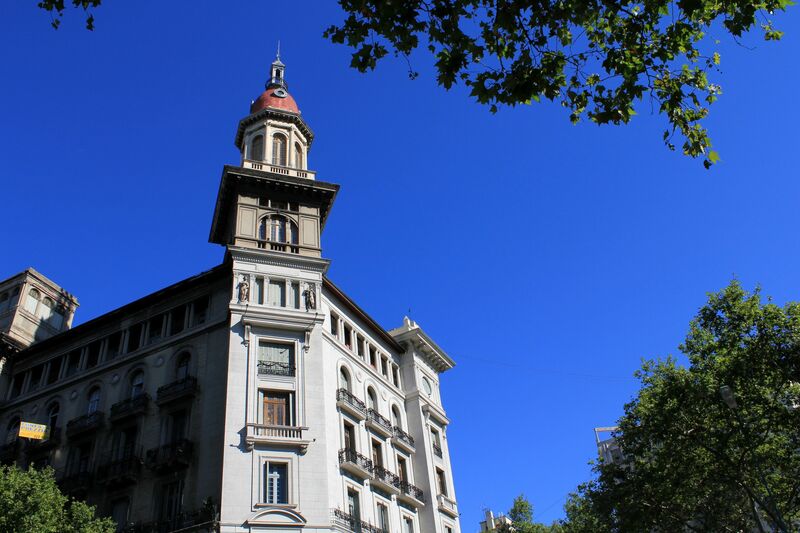 It was intended for prestigious rental offices on the equally prominent Avenida de Mayo. The construction lead by an Italian architect Luigi Broggi started in 1908 and was completed in two years with much celebrated opening on May 25, 1910. 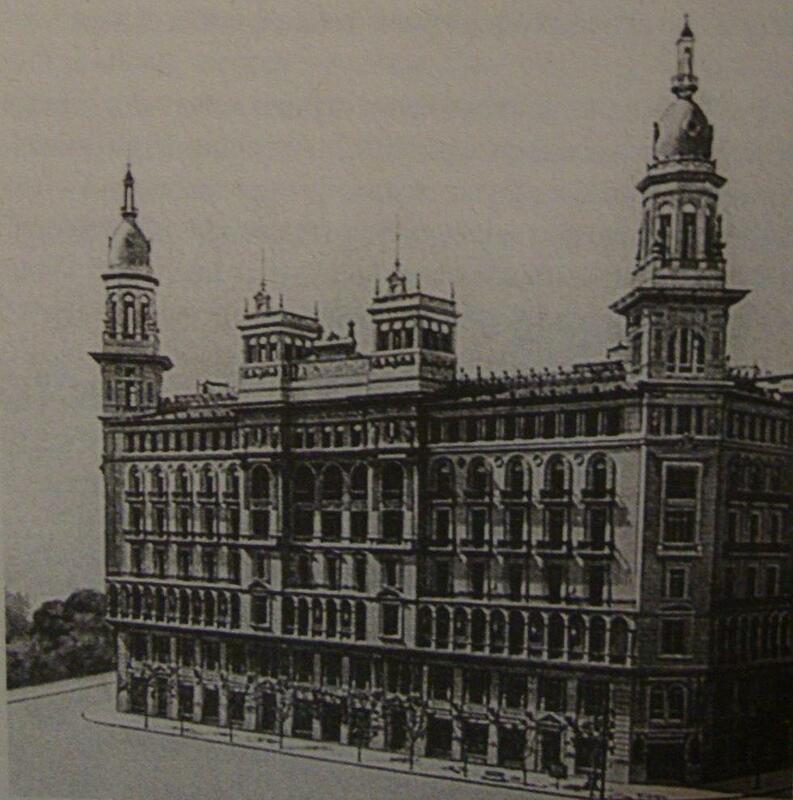 The Immobiliara installed its offices on the second floor, while the ground level was purchased by William Heinlein for his business (for that reason the building was also known as “Palacio Heinlein”). Today the building houses the branch of Banco Nacion, Research Institute of History of Law, various shops, offices and residential apartments. 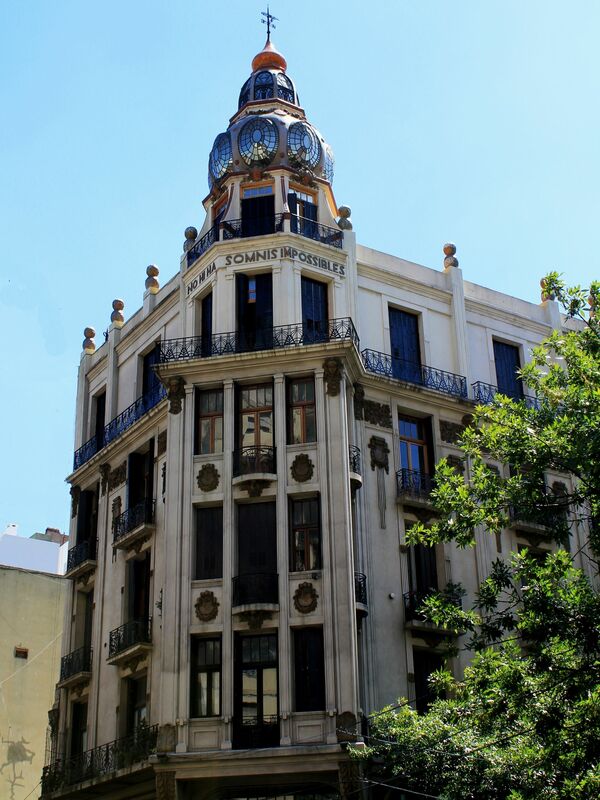 Designed in an Art Nouveau style, it draws an attention thanks to beautifully symmetrical, reddish-domed twin towers. 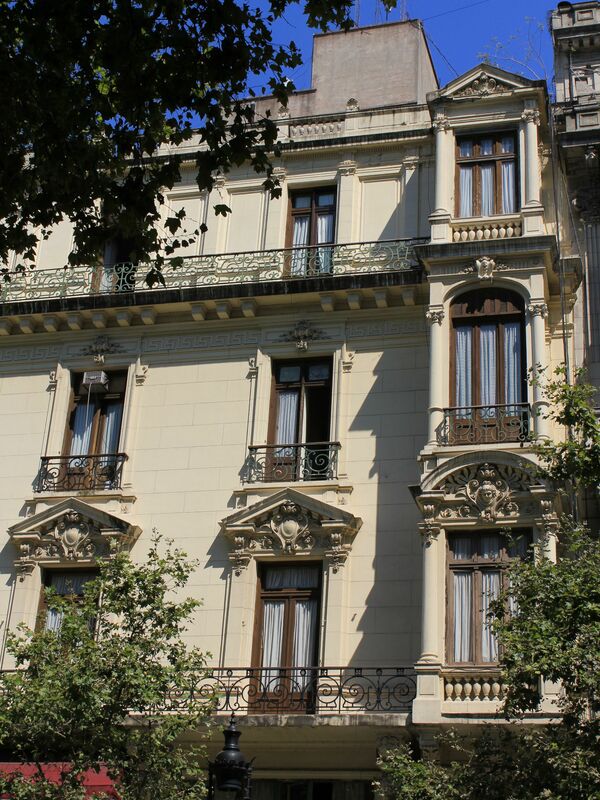 The façade on the Avenida de Mayo includes arches, columns and Italian accents in form of “lodges”. The niches on the top level hold the sculptures of Venus and Apollo. Sorry - no higher resolution available! Drawing (upper picture) and photo (lower picture) of the building La Immobiliara from 1910. Elisa Radovanovic (2002). Buenos Aires: Avenida de Mayo. Ediciones Turísticas de Mario Banchik. La Immobiliara today - view from the Plaza of Congress. 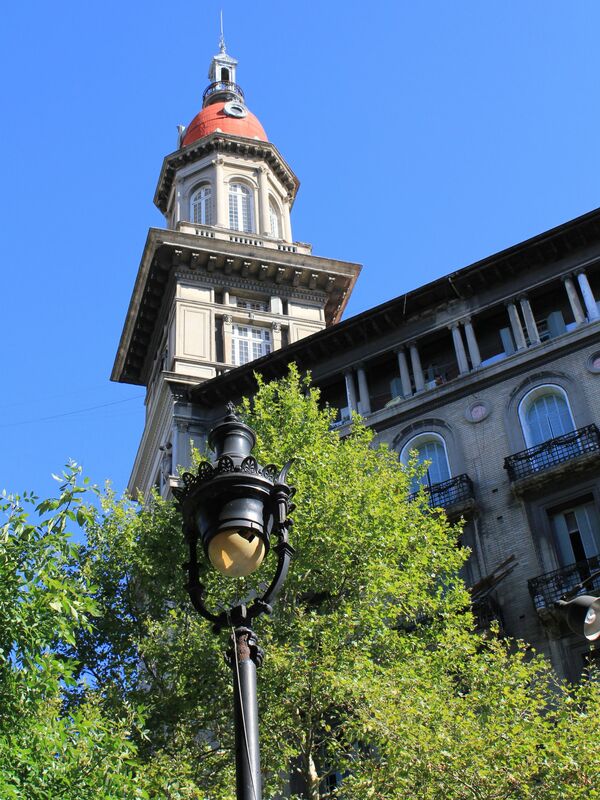 Tour of Plaza of Congress - "Touch" of Gaudi"
On the Avenue Rivadavia not far from the National Congress there are two Gaudi-inspired buildings designed by the Spanish Architect Eduardo Rodrigues Ortega and built in the period of 1903-1907. 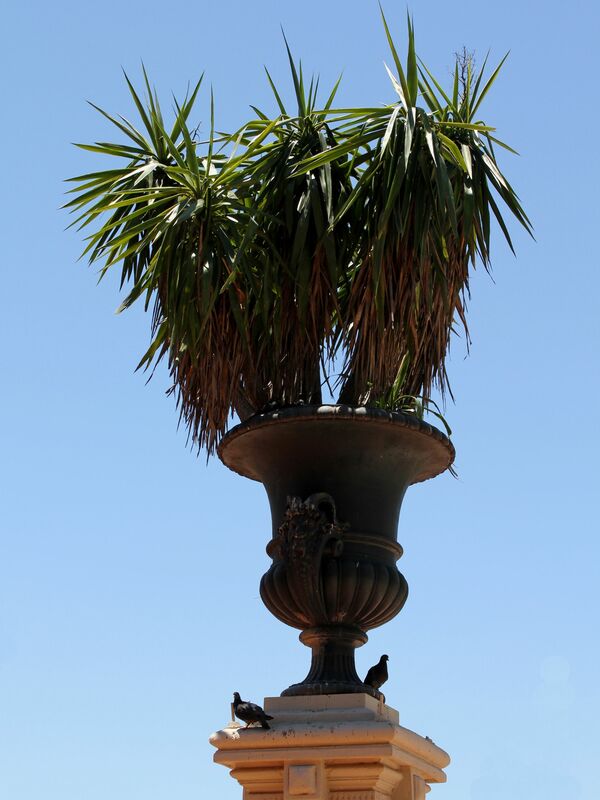 The one on Rivadavia 2027 is called the Palace of Lily thanks to its soft undulated lines richly ornamented with lily flowers, stems and trunks of trees. 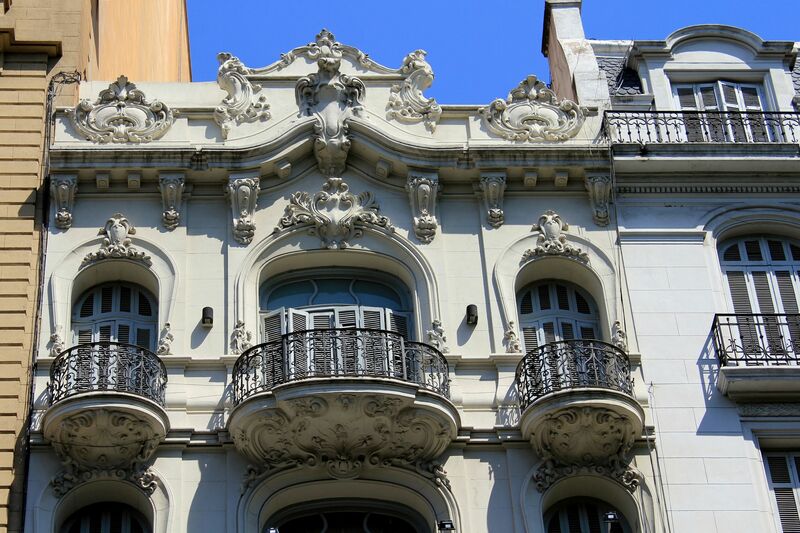 The iron doors and metalwork on balconies present the similar spiral shapes of stems and flowers. 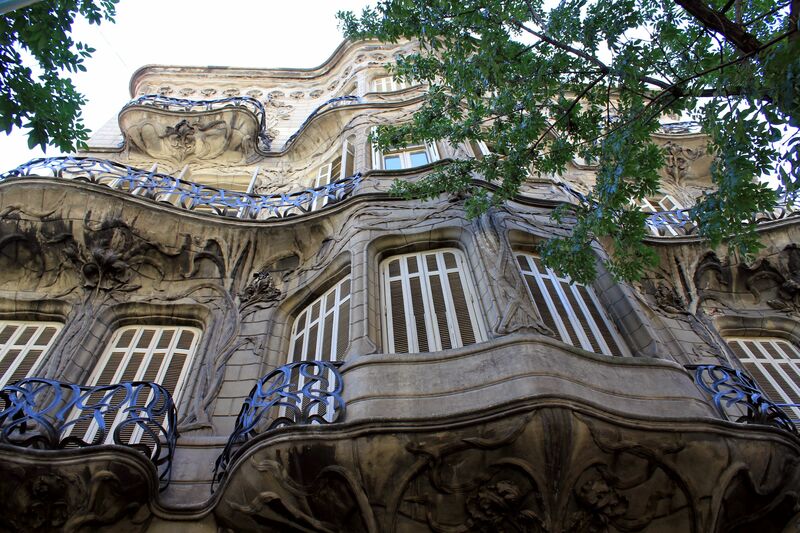 This tendency of curved shapes and undulating lines on the façade of the building creates the “elements of fantasy” so typical for Gaudi’s work. Only cornice brings some exception to the “botanical” decorating rules using the pattern of curled hairs and having at the center a face of an old man with long hairs (some recognize it as the Greek’s god of Oceans – Posejdon). Gaudi's-like curved shapes and undulating lines on the Rivadavia Street. The second building by Eduardo Ortega, located few tens of meters away at the corner of Rivadavia and Ayacucho does not exhibit so clearly shapes in “organic forms of nature”. What brings passersby’s attention is rather its beautiful glazed dome with an inscription below that reads: “No Hi Ha Somnis Impossibles” (There are no impossible dreams)! Well, I can only say - it’s so true! 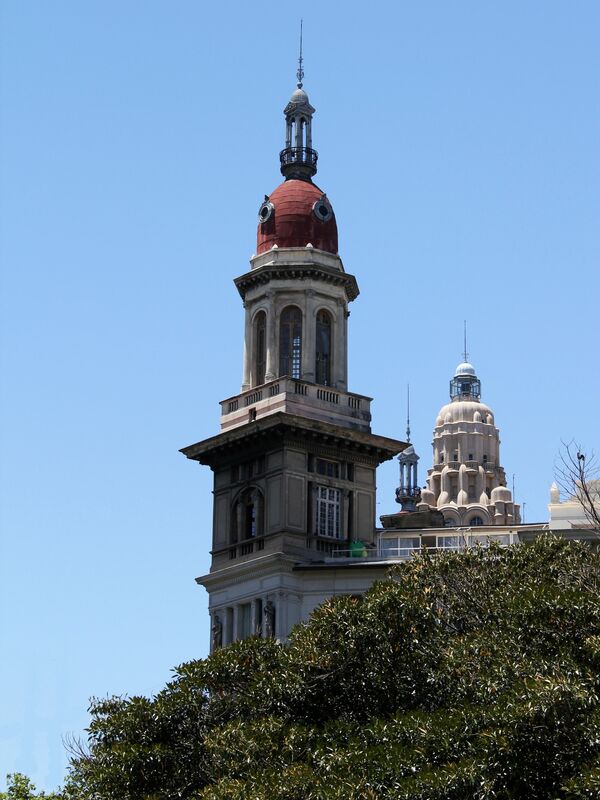 Streets of Buenos Aires offer a wide spectrum of architectural trends.... On the photos - neighborhood of the Plaza del Congreso. Events on Plaza of Congress: "Un Dia de Reyes Magos"
The Plaza of Congress is also a place of cultural and religious events. 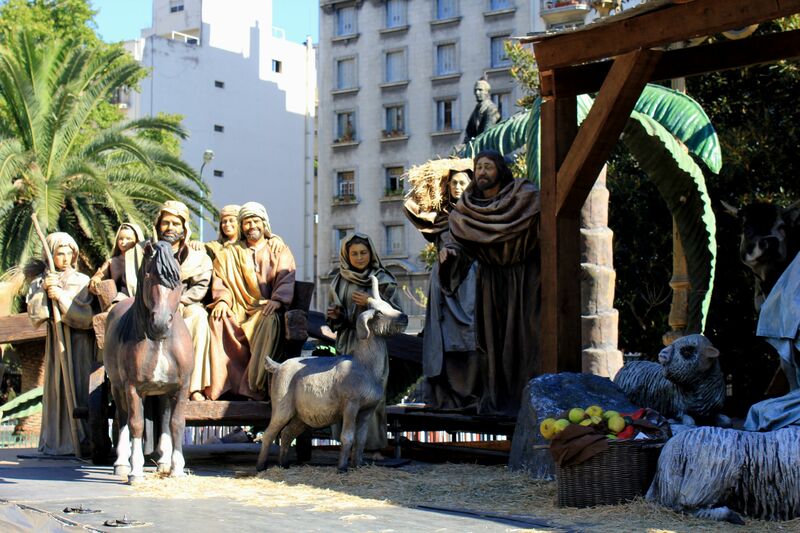 For example during Christmas time a beautiful Nativity scene with life-size figures is presented on the Plaza Moreno. Illuminated till late night, it is a lovely attraction first of all for families with children but also for visitors. On Epiphany (January 6th), festivities include arrival of biblical Three Wise Men (Three Kings - Melchior, Gaspar and Balthazar). The day known in Spanish as “El Dia de Reyes Magos” for many (especially for children) is actually a culminating point of Christmas because that day presents are given. Obviously Magos play the role that we reserved for Santa, but I think it does not matter, what counts is a final effect – gifts! (and in a wider sense – Generosity!). The joyous caravan led by Reyes Magos arrives on camels (or horses) to the scene of the Nativity on the Congress Square (Plaza Mariano Moreno). According to the tradition, Kings offer gifts and treats to children gathered at the place. The festivities, combined with writing letters to Reyes Magos are organized each year by the Association of Friends of the Avenida de Mayo. The last accent from the Plaza del Congreso – The square holds the reference point called “Zero-kilometer” for calculation of distances on all domestic routes originating in Buenos Aires.